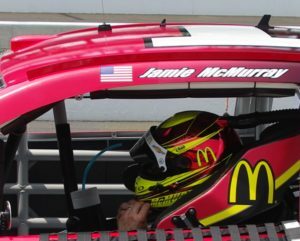 (NASCAR)—Joplin driver Jamie McMurray likely will need some help next Sunday at Dover if he wants to move to the next round of the Chase for the NASCAR Championship. McMurray ran strongly most of the race at Loudon, NH, only to fall far behind when he pitted for new tires with less than ten laps left. He finished nineteenth and is tied with Austin Dillon, five points out of twelfth place in the championship point standings. He needs to be in the top twelve to advance to the second round of the Chase. Teammate Kyle Larson is twelfth. The Dover “Monster Mile” has not been good to McMurray. He was 21st in the first race this year. He had finishes of seventh and fourth last year after fourteen races without a top ten. McMurray has gone 100 races without a win. Eleven other active drivers have had longer dry spells. Columbia’s Carl Edwards recovered from a late-race penalty for a pit road violation with solid pit work later and finished sixth. He’s tied for ninth in the Chase points headed to Dover. Kevin Harvick got past Matt Kenseth with six laps to go to win at Loudon and join Martin Truex, Jr., with a guaranteed spot in the second round. (IndyCar)—With the season wrapped up, it’s time for speculation about next year’s drivers and teams. The key decision appears to rest with Roger Penske, who has two drivers reaching the end of their contracts this year—Helio Castroneves and Juan Pablo Montoya. Most speculation is focusing on Montoya, who won the Indianapolis 500 for Penske last year after returning from NASCAR. Penske says no decision will be made for a month or so. Montoya says he knows he’ll be racing for somebody in 2017 in the series. Penske drivers Simon Pagenaud, Will Power, and Castroneves finished 1-2-3 in points this year. Montoya was 8th. The Captain is reportedly interested in picking up Josef Newgarden, who was part of Ed Carpenter Racing this year and was fourth in points. IndyCar driver James Hinchcliffe and his partner have survived the first cut in the “Dancing With the Stars” competition although his practice time was limited because he was involved in last weekend’s final race of the year, at Sonoma. Castroneves on the competition in 2007. (Formula 1)—Six races left and Mercedes drivers Lewis Hamilton Nico Rosberg are locked in an intense fight for the championship. Rosberg, who won the first four races of the year, has won the most recent three. Hamilton won six out of seven during the summer to take the points lead before Rosberg’s recent hot streak has put him eight points up. Formula 1’s next race is the Grand Prix of Malaysia next Sunday.